We will understand each of this qualities in the later session of this series. In this article we will understand the basic structure of a C# program. All the sample programs of this series is going to be a Console Application and we are using Visual Studio as the IDE. So first we will learn how to open a console application in Visual Studio. A console application is nothing but a program that can be executed in the command prompt of our Computer. 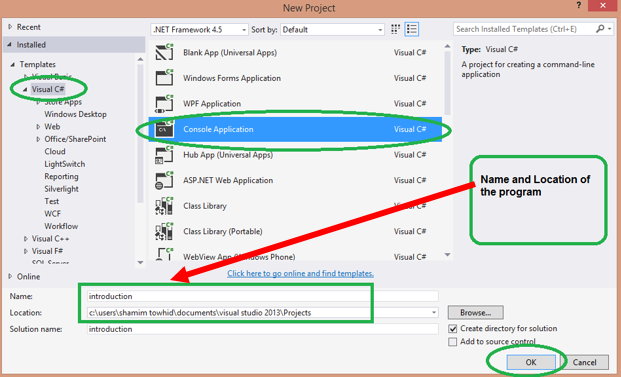 To open a console application first we have to open visual studio then from the menu choose File-> New-> Project. Then another windows will pop up then in the popup window choose Visual C# in the left and you can see console application there. Choose Console Application template and give it a suitable name, you can choose the location where to save this program in your pc from here also. When you choose everything click the OK button to create the program. The above program can be said as a very basic structure of C# program. Now we will describe each line of the above program. To run the above code press Ctrl+F5. Then the command prompt should appear with the message “Hello world”. Namespace is used to organize our code more effectively. If you don’t use the namespace declaration at the top then each time when you use a method you have to write its namespace which is more time consuming. So the use of namespace declaration is important. Now the next thing in our basic structure is a Class declaration. We assume that you are familiar with OOP and if you are so then you are already known to class. Like other OOP language the class declaration in C# is exactly same. Anything you write in C# is belongs to a class. There are different types of class in C#. We will discuss it later in this series. Just for now we can say any piece of code should be inside of a class. Here the name of our class is Program. Now we should be able to see both messages. • A namespace is a collection of Classes, Structs, Delegates, Enums, Interfaces and used to organize the code more effectively. • Our program starts with the Main method and terminates when the Main method terminates.